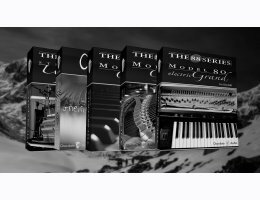 The 88 Series Pianos bundle features 5 pianos and 7 NKI instrument files for a expansive set of instruments that gives you an enormous amount of resources for expressing yourself, right at your fingertips. This bundle features the following products: O.D.D. Grand, Model 7 Grand, Model D Grand, Steinbach Upright, and Model 80 Electric Grand. The recordings used in the release were done with up to 29 different position and placements. The Microphones were all top-notch models and recorded with the shortest possible path to the converters, featuring Millennia, Neve, SSL and Focusrite preamps fed into Apogee converters at 96K. The recording venues were chosen according to bring out best of the pianos themselves. This included a studio with a large concert-like room for the grand codas and a studio with a medium-sized lively room for the upright piano. The Model 80 Electric Grand is a nice addition to this collection. It is the only electric piano with proper piano hammer mechanics and a staple of the sound of popular music from the '70s and '80s.